The name of a non-Israelite held up by Rabbi Eliezer and other rabbis to his brethren as an example of true love and piety toward parents. He lived in Ashkelon, and occupied there a high position, being πατήρ βουλἥς, "head of the council" (Pesiḳ. R. 23). One day, when grossly insulted by his mother in the presence of his colleagues, he preserved his reverential attitude toward her, and no angry utterance escaped his lips. Dama was once in possession of a precious stone wanted to complete the breastplate of the high priest. The agents commissioned to buy it happened to come when his father was asleep, the key of the box containing the stone being under his pillow. No offer of the agents could induce Dama to disturb his father. The agents were disappointed and went away. It is further related that in the year following, a red heifer was born in his herd, which compensated for the sacrifice incurred in carrying out his filial duty. As regards the name "Netina," it can not be determined with certainty whether it is that of a male or of a female. "Netina" may mean one of the Netinim (see Mishnah. Ḳid. i. 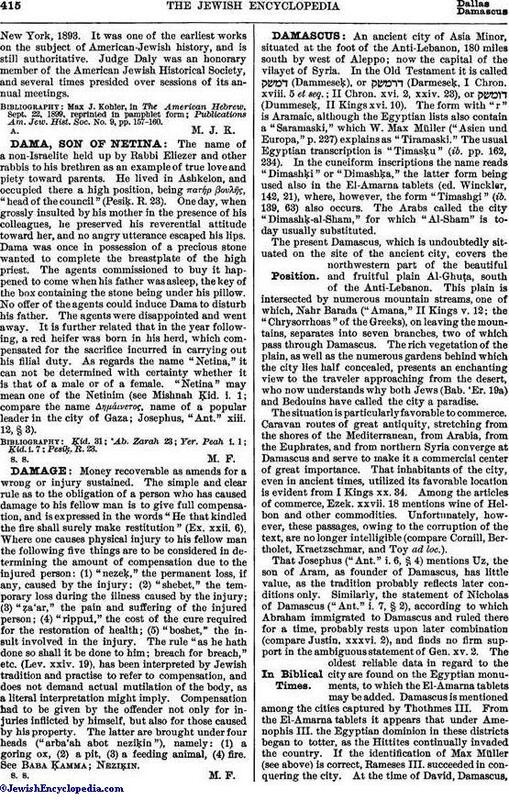 1; compare the name Δημάινετς, name of a popular leader in the city of Gaza; Josephus, "Ant." xiii. 12, § 3).